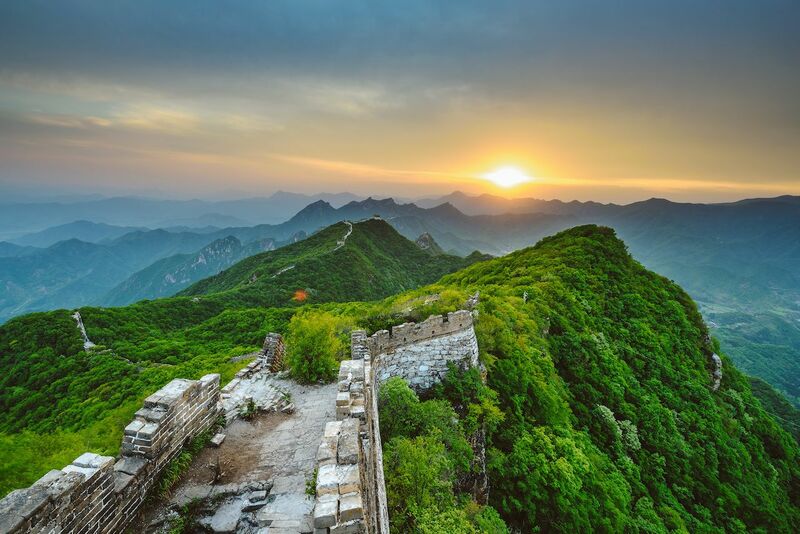 When most travelers come to China, they think of big cities like Beijing or historic sites like the Great Wall — hiking is hardly on their radar. After all, China is hard enough for visitors to navigate inside its cities; hiking there seems to present a whole new world of challenges. 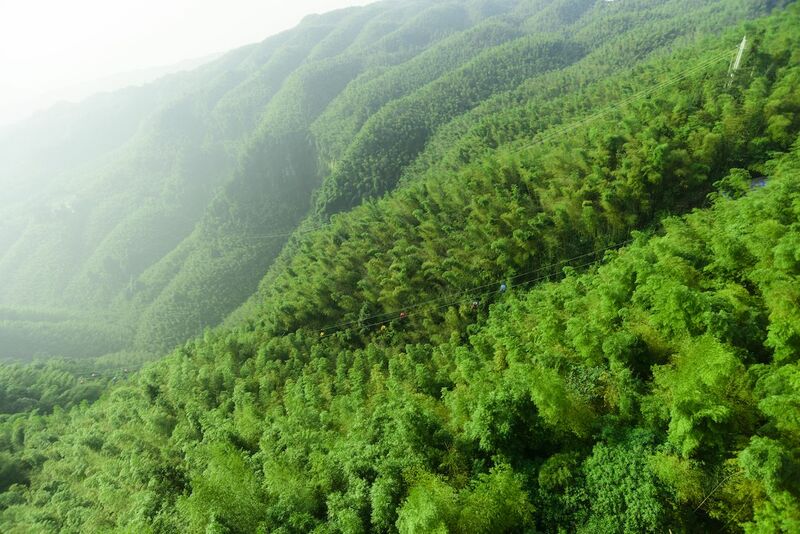 But China has some of the most stunning, and unusual, forests and mountain areas anywhere. Some of them are close to major cities, although we’ve also listed places that are much farther but still so stunning and unique that they’re worth the effort. Here are some of the best hikes in China that prove it’s one of the most underrated trekking destinations in the world. First, though, you have to get over the sheer terror. The hike — which ascends almost 6,000 feet and takes up to six hours — has plenty of hair-raising moments, including a narrow set of stairs on a steep mountain ridge, with sheer drop-offs on either side and a ladder carved into the stone thousands of feet off the ground. Of all the hike’s hairy features, the one that will definitely put your heart in your throat is the “plank in the sky” — a very narrow wooden platform stretching across the vertical mountainside. You have to inch your way along this piece of wood turned towards the mountain with your back to the sky and the abyss below. The view from the east peak towards the rising sun will have made the whole hike worth it. You could always take the gondola down — and vow to never scare yourself that much again. A bus will take you back to Xi’an in two hours, but the high-speed train is much faster. 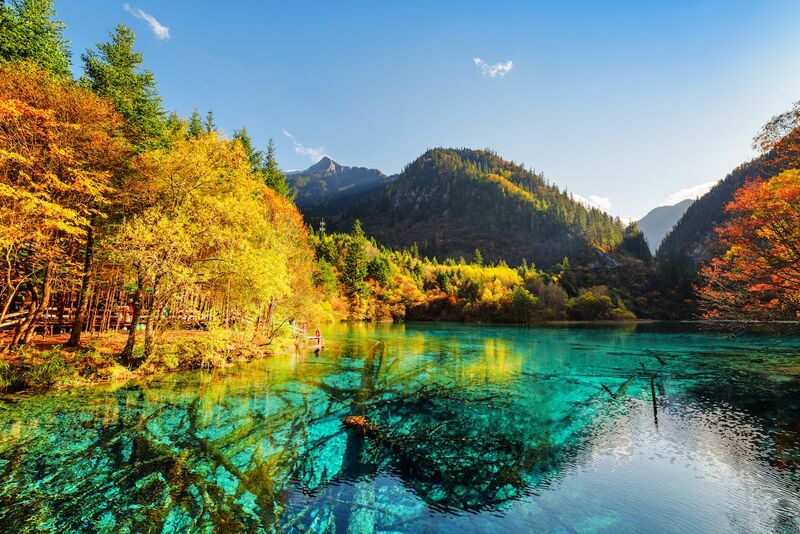 The JiuZhai Valley, or Jiuzhaigou in Chinese, is a UNESCO World Heritage site best known for its multi-colored lakes boasting different shades of blue, aquamarine, and green. It’s in southwestern China on the Tibetan plateau, which extends from India through Tibet into the Chinese province of Qinghai. The park’s base elevation is about 6,000 feet, and its peaks extend up to nearly 15,000 feet. Hikes here take you through the Shuzheng, Zechawang, and Rize Valleys without a lot of elevation gain. Pack a lunch and take your time walking through the valleys; a park bus can take you back at the end of the day if needed. You’ll see mountains and forests behind lakes of clear, amazingly blue water and incredible waterfalls. The forest leaves are beautiful in the fall. Jiuzhaigou is not easy to get to. The closest big city is Chengdu (a flight or day-long bullet train from Beijing). Once you’re in Chengdu, you can take an 11-hour bus or hire a driver for the seven- to eight-hour drive. Or, from the airport in Chengdu, you can fly into Jiuhuang Airport, which is a 30-minute drive from the park. In 2019, a high-speed rail will take you from Chengdu to Jiuzhaigou in two hours — and seriously bump up the number of tourists. Get there before that happens. 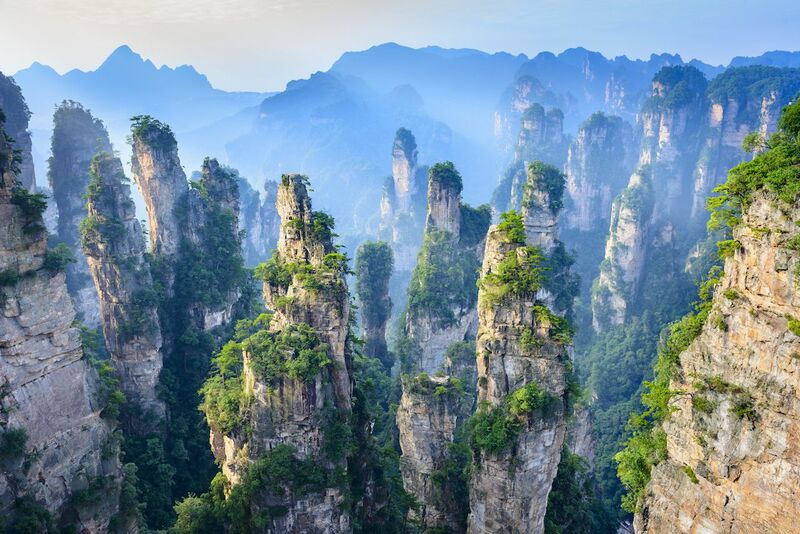 If you’ve ever wondered what’s up with all those strange mountain spires topped with grass and trees in Chinese landscape paintings, it’s the otherworldly Zhangjiajie National Forest Park. The spires — over 3,000 of them — are made of quartz and sandstone that has eroded over time, leaving crooked towers soaring into the sky. When the fog lingers along the tropical forest below, the rock towers look they’re wafting above it. The floating mountains in Avatar were inspired by these awe-inspiring formations. The park is in Hunan province, far enough from China’s major metropolitan areas that it was unknown for a long time. Today, it gets millions of visitors each year, and hotels are being built to add even more. Daily flights to nearby Zhangjiajie airport from Beijing and Shanghai have also made it very popular with Chinese tourists. To avoid the crowds, spend time hiking in the lower elevations and skip the cable car, elevator, and other areas where tourists concentrate. Your entrance fee also gives you access for four days, so you can explore some of the less-traveled areas of the park, such as the Yangjiajie Scenic Area where a steep two-hour hike leads to an amazing view. The Shunan Bamboo Forest is 46 square miles but seems even bigger as it’s so important to China — maybe because bamboo is so iconic to this country, and it’s the sole diet of China’s national animal, the panda. The opening ceremony of the 2008 Beijing Olympics began with a shot of this forest, and parts of Crouching Tiger, Hidden Dragon were filmed here. The forest has rolling hills covered in bright green bamboo, waterfalls, caves, and a lake. Shunan is a few hours south of Chengdu by car. Regular (not high-speed) trains or buses will get you there in from Chengdu in under five hours. Like many other natural sights in China, cable cars can whisk you up to the top of a mountain for a sweeping view of the area and lake. When the area is covered in mist, the hills can look like islands; this area is also called the Shunan Bamboo Sea. 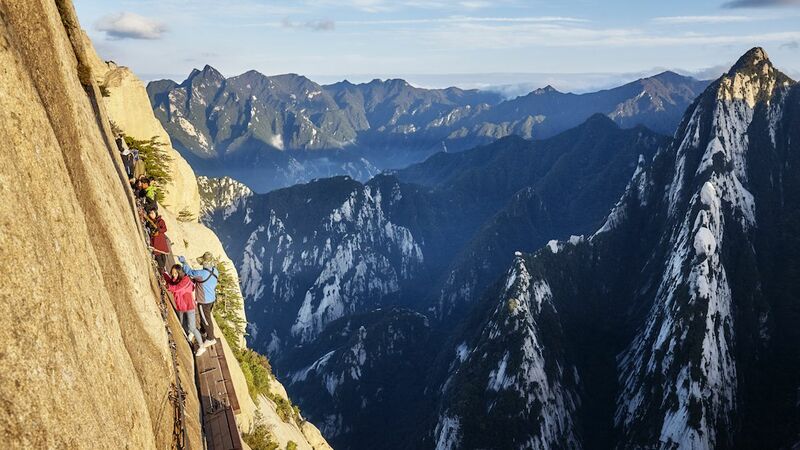 From the top of the cable car, you can hike to paths carved into the rocky mountainside. On the valley floor, you can also hike through the forest alongside creeks and waterfalls. About a seven-hour drive – or less than five hours on the bullet train — south of Beijing is the coastal city of Qingdao. Right in the middle of the city is Fushan Mountain Park. It’s an easy hike through forests of bamboo then more exposed paths near the peak of Fushan Mountain, which is 1,260 feet about sea level. Two possible starting off points for the hike are Qingdao University or Ocean University, both of which are at the foot of the mountain. This hike is an easy urban escape and gives you great views of the city of Qingdao and of the Pacific Ocean. The coolest thing about it, though, is the German bunkers set into the mountainside. Germans arrived in the area at the end of the 19th century and built the tunnels to protect against the British navy. After World War I, Japan took over and expanded the tunnels, which were used during World War II and the Cultural Revolution. Bring flashlights to explore the tunnels — or at least have your iPhone light ready. 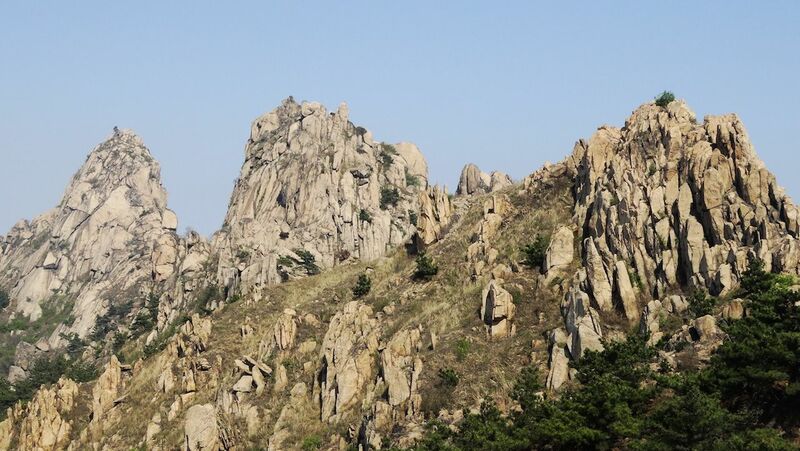 Fushan Mountain is just outside Laoshan National Forest Park, which has several other hiking trails, as well. The Kanas Nature Reserve is in the Altai Mountains of northwest China, near the borders with Kazakhstan, Mongolia, and Russia. It has hundreds of lakes, but the most important is Kanas Lake. 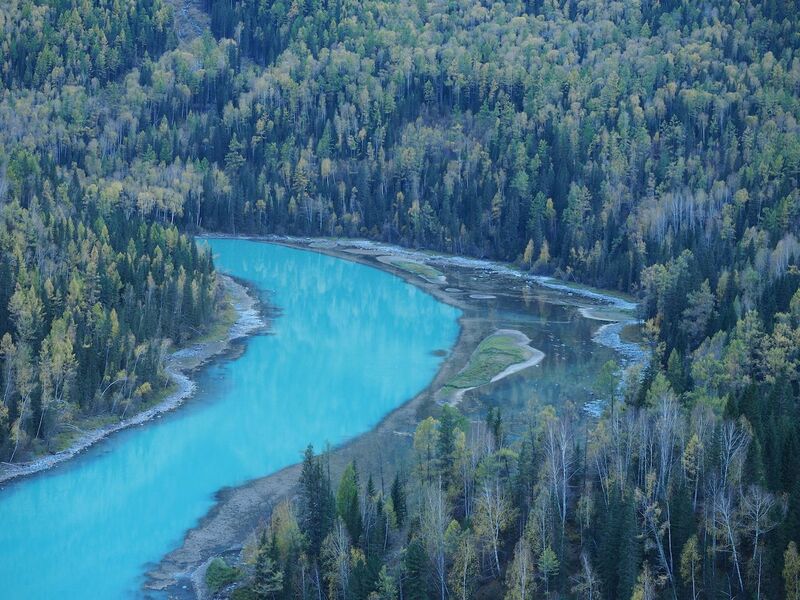 It’s a gorgeous lake inside a valley with a water color that varies with the seasons — since minerals from glacial runoff change it from blue or green to milky white. It’s the deepest freshwater lake in China with an average depth of 400 feet. The lake is over 4,500 feet above sea level, but the tall peaks near the reserve reach over 14,000 feet. Hikes around the lake include a trek to Guangyu Pavilion, which gives you views of the snowy mountains and the valley. Before you say that walking along a wall is not hiking, you need to know that Jiankou is considered one of the most difficult sections of the Great Wall of China. This is partly because much of it has not been restored, so the wall you’re walking on may suddenly be overgrown or not really there at all. Jiankou also has crazy spots like the Eagle Flies Facing Upward point, which is either named that way because it looks like an eagle or because it’s so steep that even an eagle would have to point upwards to fly along it. There’s also a stair section that can only fit one person at a time. Jiankou is a great hiking option because it’s only 45 miles north of Beijing. It’s also easier to find hiking information in English about this area — including details on where you might want to set up a tent along the way. Hiking the whole section, from the Nine Eye Tower to the Ox Horn Edge Wall, takes about two days.